A continuing united effort is underway between our Brothers and Friends in Brusciano, Italy the birthplace of the East Harlem Giglio Feast and The Giglio Society of East Harlem (www.eastharlemgiglio.org).The Festa del Giglio in Honor of Sant’ Antonio di Padua will feature a Giglio “Face”or as they call it in Italy a “Dress” acquired from the The Comitato Giglio Gioventu’ Society in Brusciano, Italy (www.gigliogioventu.jimdo.com). The lifters (Paranza) will be carrying a Giglio adorned with an authentic Bruscianese Giglio Face depicting different images or our beloved Saint Anthony. We would like to acknowledge and say a BIG Thank You to our friends Antonio Castaldo, Antonio DiPalma, CapoParanza Angelo “O’Piscator” Mocerino, the Mayor of Brusciano Giosy Romano and all the men of the Gioventu Society. We wish one and all a “Buona Festa”. Viva Sant’ Antonio di Padua. East Harlem, once the largest Italian community in the US is a pleasant memory for countless former inhabitants. To renew that memory, thousands of former residents along with their children and grandchildren will be returning to renew that bond and meet up with friends in the old neighborhood for the Feast of Giglio di Sant’Antonio sponsored by the Giglio Society of East Harlem. 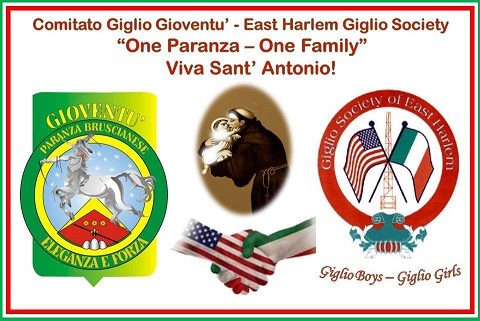 The Giglio Society of East Harlem is a group of men who have dedicated their lives to honor Sant’ Antonio, their beloved saint. Their love and devotion is on display each year during their Annual Festival held in East Harlem, New York. They honor their Patron Saint in very much the same fashion as their ancestry did and still do annually today in Brusciano, Italy by building a Giglio and dancing it in the streets of Manhattan, N.Y. The origins of the Giglio Society trace their heritage back to the town of Brusciano, Italy approximately 20 miles outside of Naples. Here an annual Feast called the Dance of the Giglio takes place in honor of Sant’ Antonio. The feast originally began back in the 1880’s when Zi Cecca DeFalco prayed to Sant’ Antonio to help cure his deathly ill child. In exchange for this cure, Zi Cecca vowed to honor Sant’ Antonio in the same manner the town’s people of Nola, Italy, a nearby town honoring San Paolino di Nola, by constructing Gigli in honor of Sant’ Antonio and dancing them in the streets of Brusciano. Zi Cecca’s prayers were answered and the dancing of the Gigli in Brusciano was born. It continues today where 6 Gigli are built for the Annual Festival during the latter part of August and danced on the shoulders of hundreds of me. For those unfamiliar with the Giglio (pronounced JEEL-YO)-it is a 75 to 85 foot tall wooden structure weighing approx 8,000 lbs with a paper-mache face adorned with beloved saints and colorful flowers. The face of the Giglio is one of the crucial components of the Giglio, each made from scratch each year to specification of the Maestro di Festa (or Master of Ceremonies) in Italy. Although the face changes yearly, one consistent fact remains and that it- the town’s patron saint can be found somewhere on the face and more likely on the top. Giglios are built in honor of a town’s patron saint and carried on the shoulders of approximately 120 men in a ritual that dates back to 409AD in the town of Nola Italy. Today, Giglio feasts are found throughout a number of towns in the surrounding area of Naples. Each town varies the tradition to meet the local town’s tradition. On the platform just above the base of the Giglio sits a multi-piece band along with several singers. The music is an instrumental part of the dancing of the Giglio as it inspires the Lifters (also known as the ‘”Paranza” in Italian) to take on the burdening weight of the Giglio and band and dance it in harmony to the music being played. Many families from the town of Brusciano, Italy migrated to East Harlem, NY to start anew with other families and friends that came before them. Although these Immigrants brought little with them on their 30-day long voyage across the Atlantic Ocean in the tight confines of the boat, what they did carry with them were their beloved traditions. For the people of Brusciano, this included the yearly Dance of the Giglio Festival in honor of Sant’Antonio. Upon their arrival, the Italian immigrants of East 106th Street in East Harlem decided to initiate their beloved traditions by building a Giglio and dancing it in the ‘New World’. The first Giglio Feast on 106th street in East Harlem started approximately 1908. Giocchino Vivolo is credited for being the first Capo Paranza on 106th Street. He along with his brother Rocco Vivola were members of the Bruscianese Society and were influential in bringing this tradition to East Harlem from Brusciano, Italy. The Festival on 106th Street grew for many years becoming one of the largest street fairs in America and remained that way until 1955. Then in 1957, the Festival moved a few blocks uptown to 108th Street where the Dance of the Giglio continued until 1971. For the 2006 Feast, it was decided to hold the Dance of the Giglio Festival separate from the annual Our Lady of Mount Carmel Feast. The Giglio Society of East Harlem continues as a Society under the auspices of Our Lady of Mount Carmel Shrine Church. Their beloved Pastor Father Peter J Rofrano..who they view as a legend in East Harlem and primarily responsible for the return of the Giglio sadly passed away on May 19th, 2007. Father Chris Salvatori who spent much of his early priesthood under Father Rofrano’s guidance describes Father Rofrano as “the icon of East Harlem.” Father returned to our Lord after almost 91 yrs here…. 3/4s of them living and working in East Harlem. 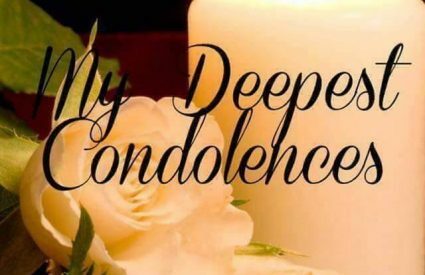 At the moment of his death, Father Rofrano was the Pastor of Our Lady of Mount Carmel Shrine Church on 115th Street between 1st and Pleasant Avenues. He was born on June 11, 1916. He grew up on East 109th street, was an altar boy at Saint Ann’s church on E.110th Street. He grew up with the early 106st Giglio. On July 30, 1939 Father was ordained to the Pallotine order of the priesthood in Rome, Italy. But East Harlem and the Giglio were in his blood. You knew this because he wanted the Giglio back in East Harlem. After an absence of nearly thirty years, his dream came true with the lift on July 16, 2000.. The Giglio Society of East Harlem will always cherish the good Father for his total support and spiritual guidance. Father Rofrano Rest in Peace. 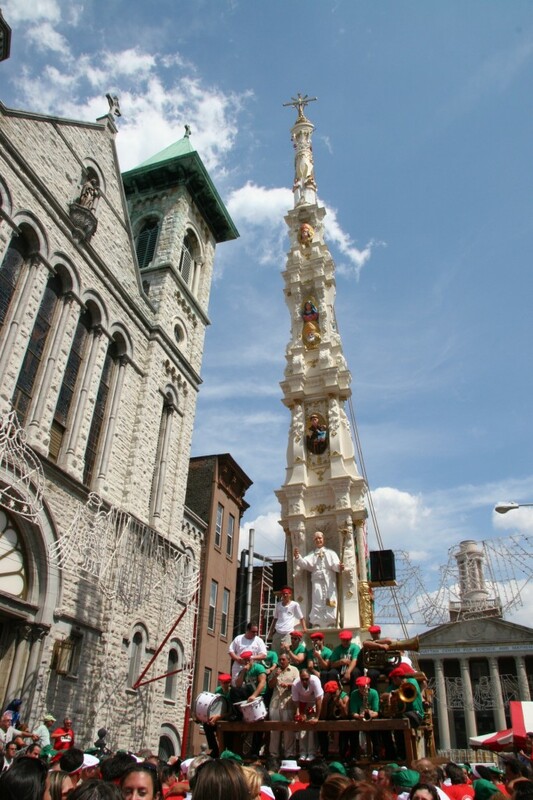 The 2014 Dance of the Giglio Feast once again returns to East Harlem in Manhattan. It will be held on Pleasant Avenue between 114th and 116th Streets. Opening Night is Thursday—August 7th ..6PM with entertainment at 8pm by the Brooklyn Keys . Friday night August 8th there will be entertainment at 8pm by The Bel Airs singing your favorite oldies until 11 PM. 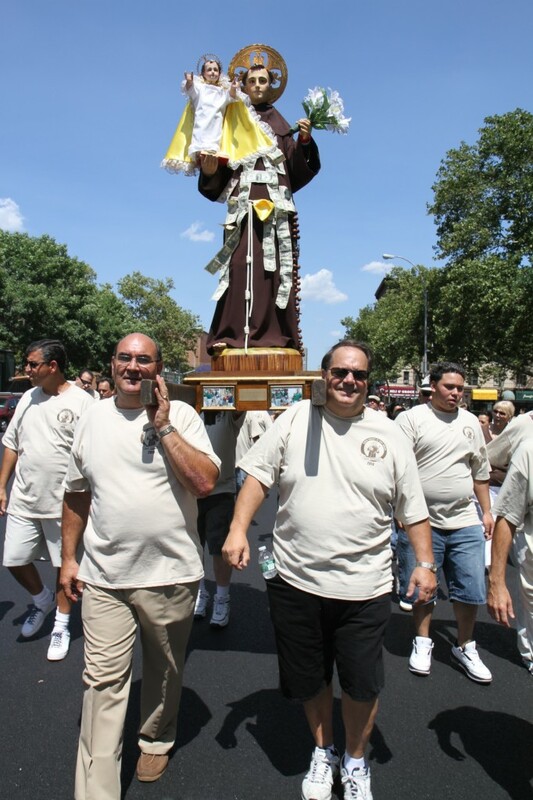 Saturday, August 9th- 12PM will start with a Procession through the streets of East Harlem in honor of Sant’ Antonio at Noon accompanied by the Giglio Band.. 7 PM will be the Dancing of the Children’s Giglio followed with DJ entertainment by Mike Guiliano, MC John Luciano playing favorite songs from 9PM til 11PM. 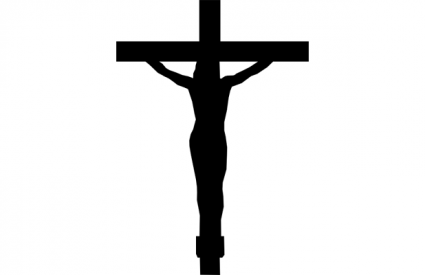 Giglio Sunday, August 10th will start with a mass for the Paranza at Our Lady of Mount Carmel Shrine church at 12:00 pm. The Dance of the Giglio di Sant’Antonio will begin at 1:30pm with additional lifts and music by Danny Vecchiano and his Giglio Band, accompanied by the Giglio singer Jimmy Alleva. Danny and his band along with Jimmy have been an integral part of the East Harlem Giglio, Long Island Sons of San Paolino as well as the Brooklyn Giglio in Williamsburg for many years. Food vendors will be available offering beverages, sausage and peppers, zeppole, steak, shish kabob, seafood and other food items. In addition, Souvenir Tshirts will also be sold (get there early for the shirts go fast). Rides and Games of Chance will also be available for everyone’s enjoyment. Have you wanted to eat at Rao’s and can’t get a reservation???? Here is your chance! The famous restaurant, a long time Giglio supporter, will provide dinner for 4 on Tuesday September 9, 2014 to the lucky winner of The Giglio Society’s Annual Raffle. The drawing will be held on Giglio Sunday nite. Winner does not have to be present. All proceeds from the Raffle go directly towards the continuation of the Giglio tradition. Tickets are available at the T shirt stand.